Tattooists and semi-permanent makeup practitioners across Hastings & St Leonards have the chance to sign up to a new scheme highlighting the hygiene and cleanliness of their business from 2017. Hastings is one of the first local authorities across the county to join the new Tattoo Hygiene Rating Scheme. 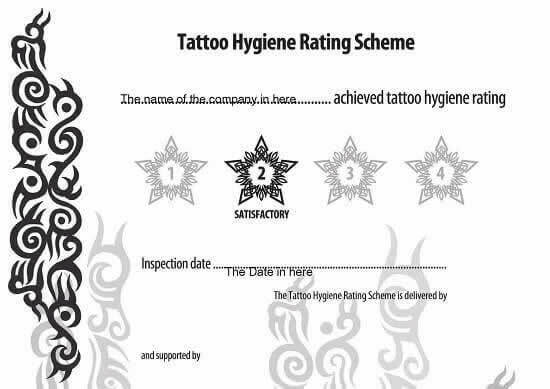 The Tattoo Hygiene Rating Scheme (THRS) is a FREE voluntary scheme aimed at improving the standards of tattooists and semi-permanent makeup artists; allowing the public to choose a practitioner that meets high standards of hygiene. The THRS has been launched across many Local Authority areas including Sussex and all registered tattoo studios are encouraged to join. See Applying for a Tattoo Hygiene Rating. Trade bodies such as the British Tattoo Artists Federation (BTAF) and the Tattoo and Piercing Industry Union (TPIU) have expressed support for introducing such a rating scheme. Research by the Chartered Institute of Environmental Health shows that 93% of customers considering having a tattoo would be influenced by a rating scheme. Tattooists surveyed as part of this research felt hygiene ratings would give recognition to well-run studios while driving out unregistered and unsafe practitioners who often operate from home, known in the trade as 'Scratchers'. This initiative will give prospective customers the confidence that the tattooist or semi-permanent make up practitioner is well trained and knowledgeable, and that the business is clean and safe. Participation in the scheme is for registered tattooists and skin piercers. The scoring system will be one to four, one being rated the lowest, two being satisfactory (basic minimum standards) and scores three and four being rated 'Good' and 'Very Good'. All participating premises and local authorities will be bound by the Rules of the Scheme [pdf]. Businesses which sign up to the scheme have the chance to get good publicity, with their ratings being promoted via social media and other means, helping to raise their profiles in a positive fashion. If you would like to know more about the scheme, or you have any queries, please Contact us at healthandsafety@hastings.gov.uk.